Today, Monnit introduced a new product for buffering temperature fluctuations for sensor readings within cooler and freezers. In typical cold storage applications, there are momentary fluctuations in temperatures that may caused by standard operations such as defrost cycles, opening of doors, and fans circulating air. 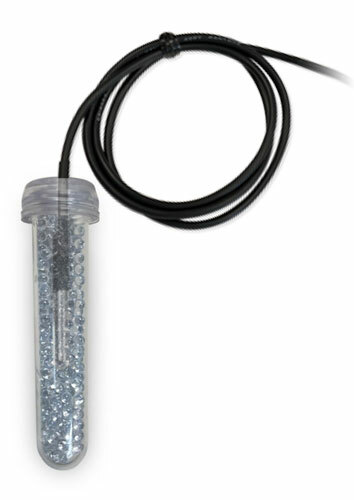 The temperature buffer uses 3mm glass beads to slow the response time of the temperature sensor allowing more accurate temperature data to be captured and prevent false alerts from being sent. This is a highly recommended accessory for every cold storage application and can be used with any Monnit wireless temperature sensor with probe. All Monnit wireless sensors include free basic iMonnit online sensor monitoring, which allows for customization of sensor operation and reviewing sensor data from any web enabled device, such as computers, tablets or smart phones. The system can also send notifications via text, email or voice call if user defined conditions are met or exceeded. Monnit wireless sensing products are FCC, IC and CE/ETSI certified, and have been proven to comply with the essential performance, safety, and environmental requirements set by law around the world. For more information on Monnit’s low cost monitoring solution, call (801) 561-5555 or visit www.monnit.com. A great article written by David Bradford, recapping technology in the state of Utah for 2015. It is wonderful to see so much progress for Utah tech companies this past year and we are honored to be mentioned in the November recap. Read the entire article at http://www.davidbradford.com/the-year-in-review/. Salt Lake City, UT – January 4, 2016 – Monnit Corporation (www.monnit.com) announced today the release of new product options for their AA family of commercial wireless sensors. Among the new options is the ability to power the wireless sensors by AC power adapters so batteries are not needed. However, two AA batteries can be inserted into the sensors to provide battery backup in the event of a power failure, so sensor operation remains uninterrupted. Sensors will switch from line power to AA battery power automatically if they detect that line power is no longer available, and switch back as soon as line power is detected again. Another new option is an integrated power switch for turning the sensors on or off without requiring the batteries to be removed. This is particularly useful for sensors that are used intermittently between different locations or in laboratory settings.